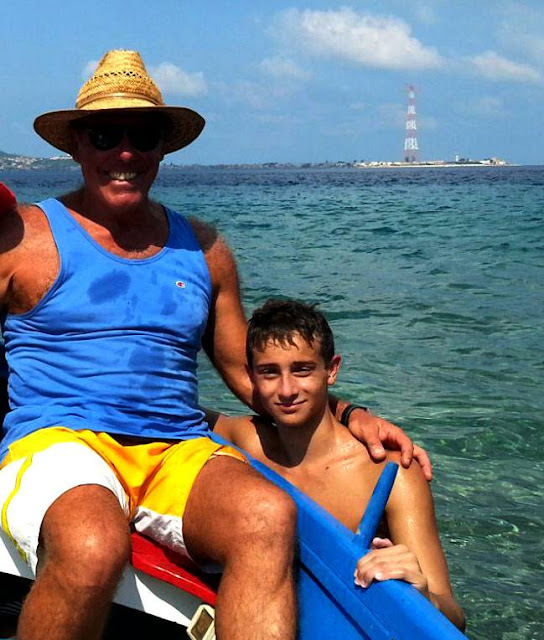 Nino Fazio has passed along his passion and talent for swimming to his son Andrea. In September, the 15-year-old Andrea set a new record for a single crossing of the Strait of Messina (Stretto di Messina) that was selected as the 2015 World Open Water Swimming Performance of the Year. His crossing from Sicily to mainland Italy took 30 minutes 6 seconds - and took down one of the oldest channel swimming records in history. "It is kind of an epochal moment in Italian open water swimming history," proudly described father Nino. "Since the old record had been set almost 40 years ago by Giovanni Fiannacca (30 minutes 50 seconds in 1975) and was previously considered as quasi-unbeatable." Andrea's record swim was due to many factors, but a lot had to do with the teenager's beautiful technique, streamlined body position and strong kick in the water. "He is a good pool swimmer for his age with his personal best in the 400m long course freestyle as 4'19", but there are other 15 year old boys faster than him. But he absolutely loves open water swimming and has participated in open water competitions since he was 10." The swim was led by Giovanni Arena [shown above with Andrea], one of the most experienced pilots in the Strait. Arena had also escorted the swimmers who set the women's single crossing record and Nino's own double crossing record. So while the son holds the single crossing record, his father simultaneously holds the double crossing record - that made this swim special. * World Open Water Swimming Woman of the Year: Bridgette Hobart Janeczko of the U.S.A. The 2015 WOWSA Awards recipients will be honored at the Big Chill Swim International Winter Swimming World Cup on February 5th 2016 at the Low Wood Bay Resort Hotel and Marina in the Lake District's Windermere, England. Hosted by Chillswim and Colin Hill, the 2014 and 2015 recipients will be presented their awards by Lewis Pugh, United Nations Patron of the Oceans. The 2014 WOWSA Award recipients include Estonia's Henri Kaarma as World Open Water Swimming Man of the Year, Russia's Dr. Nataliya Fatyanova as World Open Water Swimming Woman of the Year, Russia's Alexandr Brylin and Grigorii Prokopchuk as World Open Water Swimming Performance of the Year, and Ireland's Step Out Of The Ordinary Blue Letter Campaign as World Open Water Swimming Offering of the Year). The World Open Water Swimming Awards tickets are available here.